Please work to post all pending legislation online. We have a government Of the people, for the people, by the people. How can we have that if we don't know what our representatives are voting on? I'm very proud to have attended what seems to have been the first "Tea Party" in Seattle on February 16, 2009. The movement has continued pretty continuously since. Today, it seems at least 10s of thousands or perhaps 100s of thousands and maybe even up to a million mainly ORDINARY Americans have descended on Washington DC to show their disagreement with the Federal Government's HUGE deficits and new, increased spending. This is a wonderful freedom we enjoy, the right to gather, protest, and speak, whatever the issue. 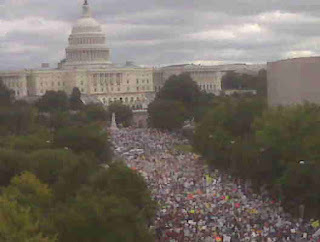 Crowd estimated to be 2,000,000!! Crowd estimates vary, still. Ranges from 200,000 to 2,000,000, most likely around 400,000. Still, a HUGE crowd. If it had been for a different cause, say anti-war, it would have gotten a lot more coverage, I think. Photo by Mary Katherine Ham, via Instapundit.